It is estimated that by 2050 there will be more plastic in the ocean the fish. Not on our watch there won't. Beach clean ups are just one of the many ways you can help protect our oceans. Every piece of litter you pick up is one less piece finding it's way to the ocean. By using a pie chart, it quickly becomes apparent that shoreline recreational activities contribute to the majority of litter. Food-related items such as plastic wrappers, plastic straws, cutlery and lids account for 90% of the total items collected. Once again by reviewing the pie chart it is unsurprising that 100% of the items collected are food affliated. 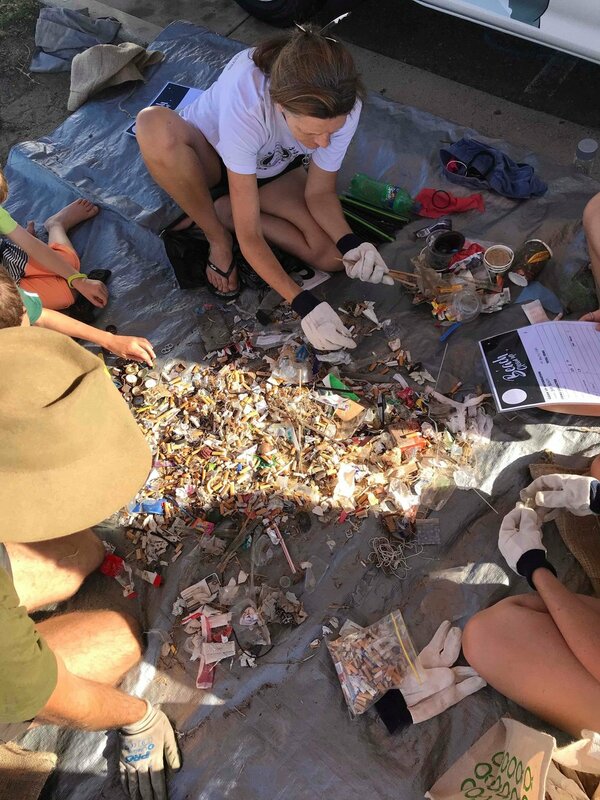 We collected 400g worth of Cigarette butts it less than an hour! And we didn't even get to the top half of the carpark. We suspected that these would be an issue, but when presented with an ever growing pile the shear scale of the issue is quite confronting. The prize for the most random item collected goes to the pair of Undies! Once again we'd like to say a HUGE thank you to all the wonderful volunteers who spent their Saturday morning with us cleaning up one of our most loved beaches. You are all absolute legends and heroes in our eyes!